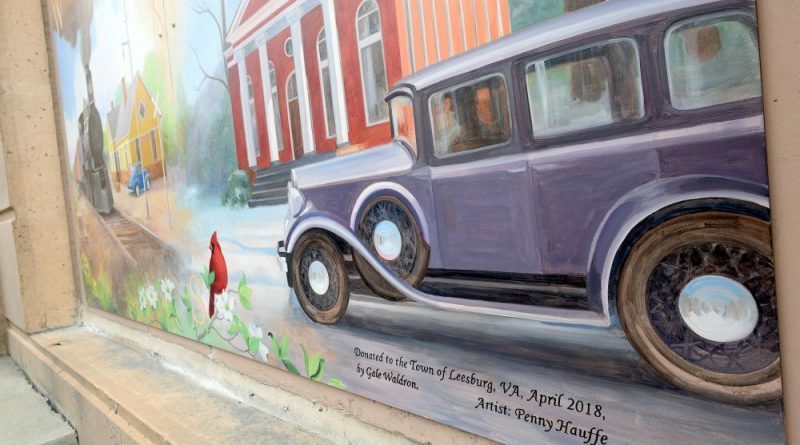 A a 1020s car passes in front of the courthous in Penny Hauffe's mural depicting elements of Leesburg's history.. The dedication to Gale Waldron appears in the lower corner of the work. Despite the success in recent years of several public art projects around Leesburg, members of the town’s Commission on Public Art do not appear to be content to rest on their laurels. COPA Chairman Tom O’Neil appeared before the Town Council last week to unveil the commission’s Public Art Master Plan. The detailed strategy lists six opportunity areas throughout town that could be the site of both large- and small-scale public art projects. It includes the downtown Arts & Cultural District; parks, trails, waterfront areas and other recreational sites; gateways and entry points into town; the Town Hall campus, which includes the Rose Garden and Loudoun Museum; other town property, such as the police department and bus stops; and surrounding suburban areas and schools. Projects in these identified areas can range from as small as a painted fire hydrant to banners throughout the downtown noting its distinction as an Arts & Cultural District. Among the goals listed in the plan include creating an avenue for the public to bring ideas for art projects to the town. Ideas for funding resources include grants, private donations, and even reserving a portion of funding in town’s overall capital projects program for public art. The expansive plan also lists the many success stories to date—with the LOVEworks sculpture and ArtsPARKs sculpture garden along Harrison Street becoming their own draws; and the recent murals downtown honoring Gale Waldron and another bringing some color to the Liberty Street parking lot. A mural on the South King Street bridge is in the works. Art in the downtown has also become a bit more interactive lately, with the launch of the Gallery Game on the third Fridays of every month. O’Neil’s presentation also gave a preview of what’s yet to come. A sculpture to be installed on the Leesburg skatepark property on Catoctin Circle to bring more visibility to the recreational spot. O’Neil said young skatepark users will be asked to participate in helping to select a sculpture. “Hopefully, it’s something they can relate to as well as the public and that you all can be proud of,” he said in addressing the council. An upcoming project off Russell Branch Parkway looks to bring some life to the town maintenance building. O’Neil said the commission is working with area high school students to paint a work-related mural on the side of the building. The image hasn’t been decided, and would come before the council for approval. “It would be related to the purpose of the building so you can recognize what the building is there for,” he said. The Public Art Master Plan can be viewed at loudounnow.com/publicartplan.